A new 5 MW solar farm at the University of Tennessee is generating clean energy; it's also generating a lot of interest—and education—in solar power in Tennessee and the southeastern U.S. The University of Tennessee inKnoxville is in the business of education, and that charge even carried through to the recently dedicated 5 megawatt solar farm that the university was involved in constructing. Strategically located along Interstate 40 about 50 miles east of Memphis, the West Tennessee Solar Farm was built in a semi-circle to allow for the subsequent construction of an educational visitors' center. One exhibit already in the works is Spectrum, an interactive solar exhibit. The center (which will showcase not just solar, but other forms of clean energy as well) and the accompanying highway interchange are slated for completion by the end of 2013, said Paula Flowers, a consultant and president of Enovation Group LLC in Oak Ridge, Tennessee, who acted as the project manager for the university research foundation. "The farm isn't just for power generation," Flowers said. "It's also demonstrating clean power technology and educating people." Ben Fischer, president of Chattanooga-based Signal Energy LLC, the solar farm's design/build contractor, agreed. "It's unique because it was designed in a way that would allow for the Tennessee Department of Transportation visitors' center in the middle of the array," Fischer said. "They'll be able to use that as an educational tool and show this type of installation is viable in the state of Tennessee." The 10 million or so drivers annually on I-40 won't have difficulty seeing the solar farm. 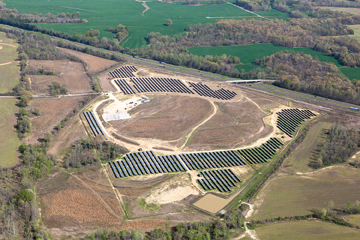 At 5 MW, it is the largest solar facility in Tennessee and the Tennessee Valley Authority's seven-state service area. It's also one of the largest in the Southeast U.S. The Tennessee State Department of Economic and Community Development first approached the university about the project in 2010, Flowers said. At the time, then-Governor Phil Bredesen was evaluating what types of projects to submit to the Department of Energy (DOE) for American Recovery and Reinvestment Act (ARRA), or economic stimulus, funding. "Governor Bredesen would rather do three projects worth $100 each than 100 projects worth $3 apiece," Flowers said about the governor's approach of doing only a few large projects. He conceived the Volunteer State Solar Initiative, a comprehensive solar energy and economic development program. The goal of the program was twofold: create jobs and position the state for long-term growth in solar energy development. The West Tennessee Solar Farm was one of two projects contained in the initiative. The other involved a partnership between the University of Tennessee's Tennessee Solar Institute and Oak Ridge National Laboratory to improve the affordability and efficiency of solar products. The Department of Economic and Community Development applied for, and received, a grant from the DOE. It then allocated $31 million to the University of Tennessee's Research Foundation for the solar farm and $23.5 million to the Tennessee Solar Institute. Signal Energy became involved after the university research foundation awarded it the contract to design and build the project. Fischer said that from the start, the project was different from many other utility-scale projects owned by independent developers that negotiated power purchase agreements (PPA) with the benefactor. In this case, the university owns the land on which the project sits and will own and operate the solar project itself. "So they wanted a well-designed system that also followed all of the unique state and federal requirements of a project of this type," Fischer said. All of the power that's generated is sold to the Tennessee Valley Authority. Proceeds will be used to operate, maintain, and expand the array as well as fund education and demonstration-related activities. The university was responsible for selecting and procuring the 200-acre site for the solar farm and educational center, Flowers said. The site had to be flat, have an unrestricted view of the sun, have good highway visibility, have easy potential highway access, and be between Memphis and Jackson. The Haywood County site met all of those requirements. The university also conducted environmental reviews, obtained the necessary permits, and took care of the initial ground preparation contracts, Fischer said. Because the project was funded through an ARRA grant, contractors had to meet "Buy American" requirements. That meant that if two products were the same and one was manufactured in the United States, the project had to use the domestic product. As part of the Volunteer State Solar Initiative, the project also had to meet "Buy Tennessee" requirements. "I can say that we had very good companies that have offices based here in Tennessee that partnered with us in the project," Fischer said. "Everything from the transformers manufactured up the road to the inverter cabinets manufactured right here in Chattanooga, which is where our office is." He was referring to the ERMCO transformers from Dyersburg, Tennessee, and Lectrus inverter cabinets. In addition, BESCO, headquartered in Knoxville, served as electrical contractor. Construction began in July 2011. 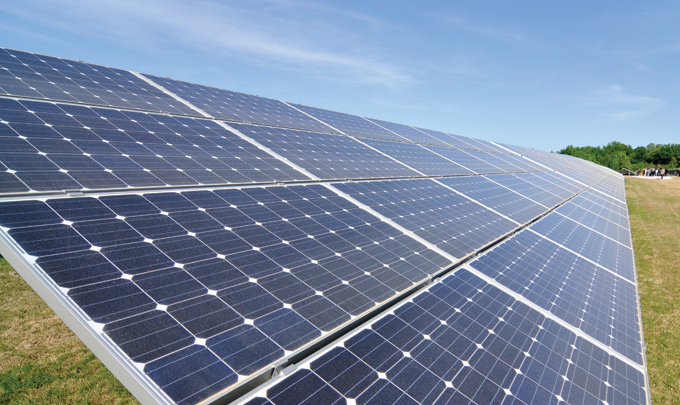 The project involved about 21,434 fixed-tilt ground-mounted crystalline silicon panels from Suniva Inc. of Norcross, Georgia. Fischer said they chose those panels because of their low maintenance and proven technology. "It's American technology designed right here in the southeast that has consistently ranked among the best for cell efficiency," Fischer said. "When we looked to the buy American requirement and considered the options that were out there, as well as the cost and quality and the ability to achieve the highest output and the lowest cost of energy, the choices all pointed to Suniva to be the best choice for the project." Strategically located along Interstate 40 about 50 miles east of Memphis, the 5 MW West Tennessee Solar Farm was built in a semi-circle to allow for the subsequent construction of an educational visitors' center. The project also involved 761 Solar FlexRacks from Solar FlexRack of Youngstown, Ohio. Fischer said they were chosen because of the technology involved and their ease of installation. "It's a fold-out rack pre-manufactured for very quick installation in the field," he said. "It's like an accordion that fans out that's just the right size to slip in the panels one by one." A three-person crew can install a rack in five minutes compared to a six-person crew requiring 45 minutes with competitors' products, according to the Solar FlexRack website. Nine inverters manufactured by SMA America LLC, Rocklin, California, were used to convert the DC current to AC. Fischer said the project took longer than expected to complete because of the numerous approvals needed from the different government entities. "There are additional hoops to jump through to be able to meet the requirements of state or federal funded projects, so they typically take longer to build," he said. "But government investments in solar energy, like the West Tennessee Solar Farm, help put our country back in its rightful position as a global leader in clean energy technologies." The semi-circle design also created design and installation challenges, Fischer said. "We had to try to maintain as much of the existing terrain while still keeping an efficient design," he said. "Normally we lay them out as close as possible while taking into account the shade impact." The semi-circle design meant additional wiring was required compared to a more compact design, he said. Signal Energy also had to design the system with future expansion of another 5 MW in mind. The power generated from the solar farm is fed into the TVA grid. But to get there, the project had to upgrade a substation and nine miles of transmission lines owned by Chickasaw Electric Cooperative in Somerville, Tennessee. Before the West Tennessee Solar Farm, the rural cooperative had little, if any, experience with solar, Flowers said. In the process, they received an education about utility-scale solar. "I think what Chickasaw picked up from the project, they've been able to share with other rural cooperatives," she said. "The university has developed an entire network now of small contractors and solar installers and utility companies." Fischer said he is looking forward to the opening of the educational center next year because Signal Energy will be able to give clients a firsthand look at the solar potential of Tennessee and the southeast U.S. in general. "Certainly, Tennessee has a much better insolation than Germany, which is a world leader," says Fischer. "Now obviously, the southwest has much better insolation characteristics. From a comparable basis, if you look at the maps that are available on the National Renewable Energy Laboratory (NREL) website, you will find west Tennessee has very good insolation characteristics."